Using data from an aging NASA spacecraft, researchers have found signs of an energy source in the solar wind that has caught the attention of fusion researchers. NASA will be able to test the theory later this decade when it sends a new probe into the Sun for a closer look. The solar wind flows away from the Sun at speeds up to and exceeding 500 km/s (a million mph). Finding that “something” has been a goal of researchers for decades. 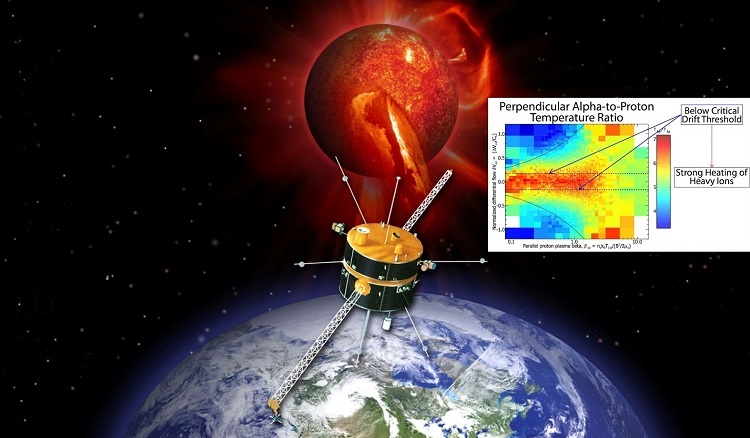 In the 1970s and 80s, observations by two German/US Helios spacecraft set the stage for early theories, which usually included some mixture of plasma instabilities, magnetohydrodynamic waves, and turbulent heating. Narrowing down the possibilities was a challenge. The answer, it turns out, has been hiding in a dataset from one of NASA’s oldest active spacecraft, a solar probe named Wind. Launched in 1994, Wind is so old that it uses magnetic tapes similar to old-fashioned 8-track tapes to record and play back its data. Equipped with heavy shielding and double-redundant systems to safeguard against failure, the spacecraft was built to last; at least one researcher at NASA calls it the “Battlestar Gallactica” of the heliophysics fleet. Wind has survived almost two complete solar cycles and innumerable solar flares. An artist’s concept of the Wind spacecraft sampling the solar wind. Justin Kasper’s science result is inset. Ion cyclotron waves are made of protons that circle in wavelike-rhythms around the Sun’s magnetic field. 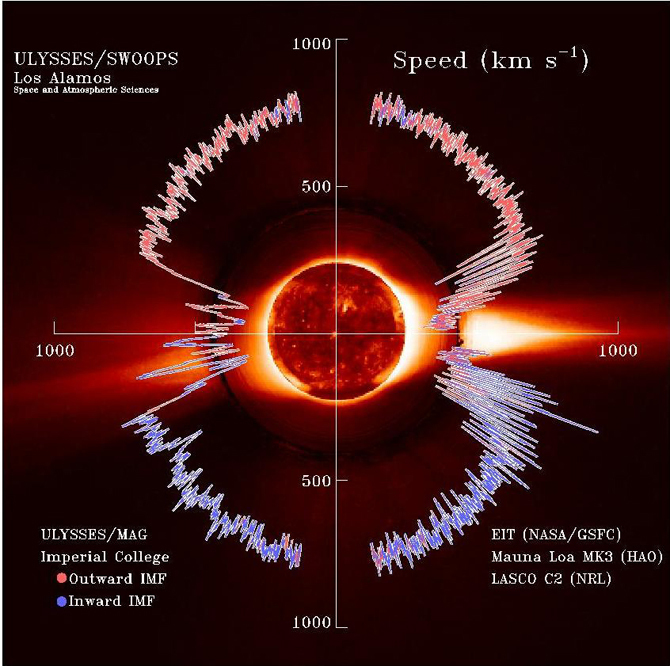 According to a theory developed by Phil Isenberg (University of New Hampshire) and expanded by Vitaly Galinsky and Valentin Shevchenko (UC San Diego), ion cyclotron waves emanate from the Sun; coursing through the solar wind, they heat the gas to millions of degrees and accelerate its flow to millions of miles per hour. Kasper’s findings confirm that ion cyclotron waves are indeed active, at least in the vicinity of Earth where the Wind probe operates. An artist’s concept of the Solar Probe Plus approaching the Sun where it can test the ion cyclotron theory. “I have been invited to several fusion conferences to talk about our work with the solar wind,” he says. The research described in this story was published in the Physical Review Letters on February 28, 2013: “Sensitive Test for Ion-Cyclotron Resonant Heating in the Solar Wind” by Justin Kasper et al.